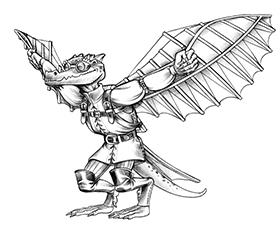 Gods and demons are a vital part of the swords and sorcery genre – as are their followers. Conan battles evil priests while swearing, “By Crom!” Elric surges into combat promising blood and souls for his divine patron Arioch. Fafhrd and the Gray Mouser often find themselves pawns in the schemes of Nehwon’s conniving gods. Kobold Quarterly #21 delves into the roles played by the divine in your campaign, featuring David “Zeb” Cook on using mystery cults in your game, Tim and Eileen Connors on soul-shredding clerical dilemmas, Marc Radle’s new shaman base class for Pathfinder RPG, and an ecology of the succubus with new feats, powers and traits for D&D. 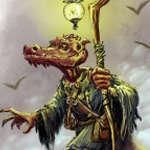 Pick up Kobold Quarterly #21 in print or in PDF at the Kobold Store! Dumb question time: is the succubus article usable with Pathfinder? Not a dumb question at all! 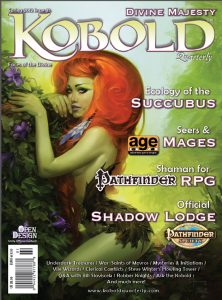 The succubus article is around 7 pages long, with one and a half pages of that devoted to 4e crunch. There’s plenty in it you can use in Pathfinder or any fantasy RPG. That Ecology is, however, linked to the 4e version of the succubus. For Pathfinder, it would apply more to the erinyes, but it’s really strong, evocative material regardless.